Your poetry unit is coming up and you are wondering how on earth you are going to get your students to love poetry as much as you do. For a select few of our students, the beauty of Emily Dickinson's unique style and the transcendent power of Walt Whitman is enough. For the rest - what to do???! I remember stumbling onto my first explanation of poetry slam years ago, while asking myself this exact question. Slowly its history unfolded on my glowing screen, late at night after a busy day of teaching and coaching. I was so excited to discover the concept of poetry contests, to see the huge level of audience engagement on the videos I found, to imagine my students, too, falling for poetry. Here's a little introduction to poetry slam to get you started, if you are not familiar with the concept. Armed with audio and video clips of poetry slam, I hatched a plan that was, in retrospect, crazily ambitious. 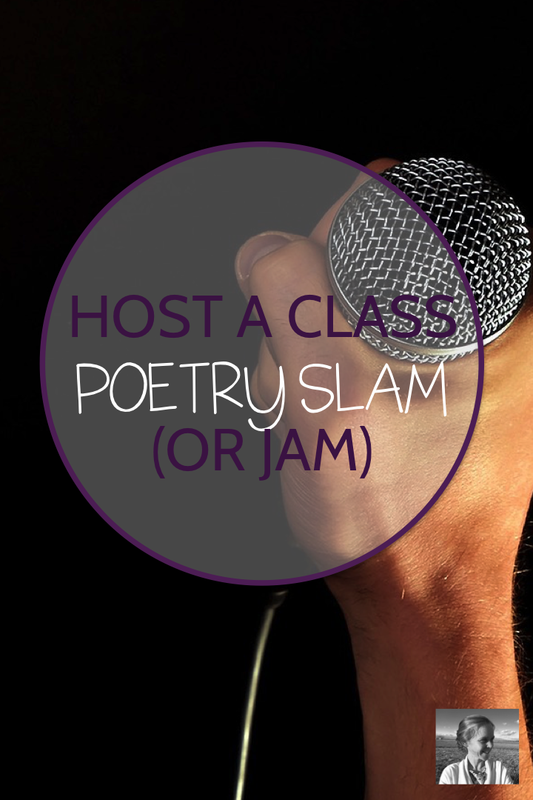 In each of my classes I would introduce the slam, spend a week doing writing workshops, watching and judging slam clips, organizing students into committees to run an actual slam, and then culminate the week with our own class slam. I rolled out the plan on Monday in each of my classes. 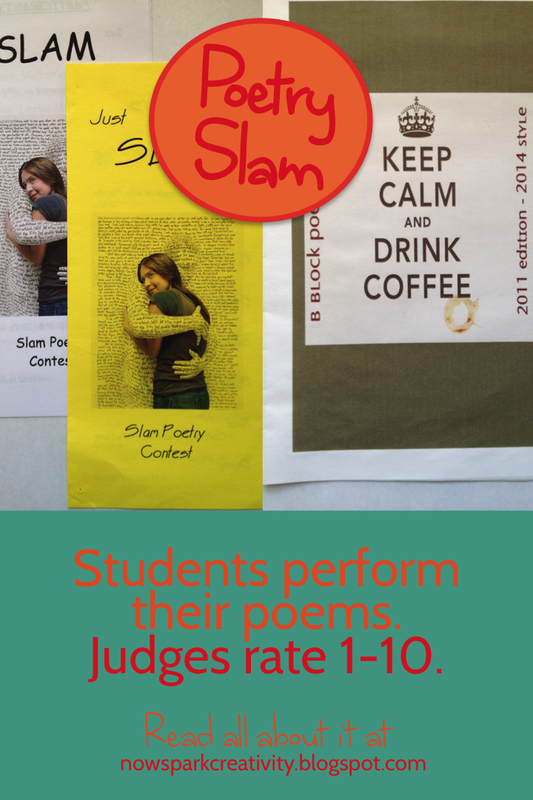 I explained the concept of the slam, in which poets stand up and read a poem, and judges score the poem on a scale of 1-10. There would be no rubric, no specific criteria except the feelings of the judges. I pulled up some slam clips like Poetri's "Krispi Kreme Donuts" and Alexandra Oliver's "Love" for students to watch and asked them to write down the scores they would give if they were judging. As I called on students to give and explain their scores, we all realized opinions varied wildly. 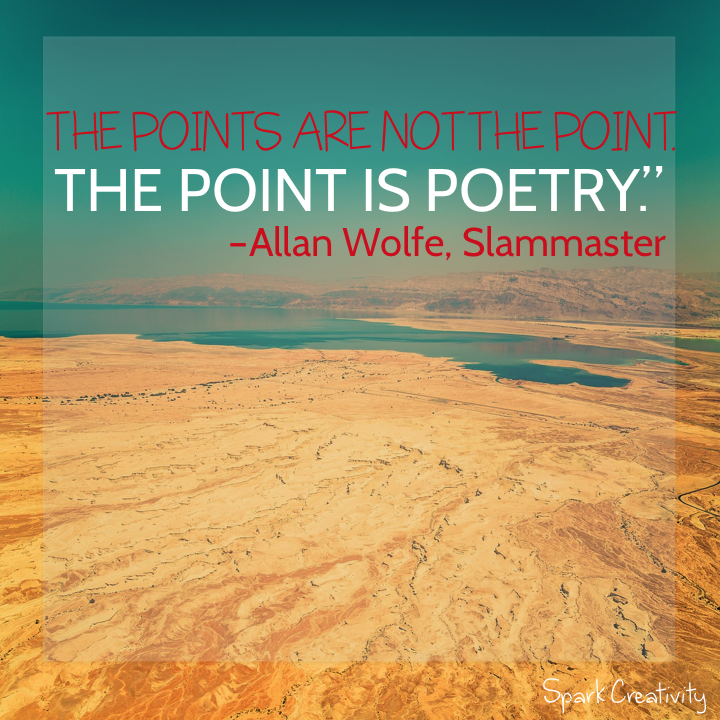 But as the oft-repeated poetry slam slogan goes, "the points are not the point, the point is poetry." That day I also explained the plan for the week. I let students form committees to produce our slam - one would create programs, one would be in charge of judging and also choose and prepare an emcee for our slam, and one would plan the ambiance (location, refreshments, decorations). Throughout the week we watched more slam clips for inspiration and to practice judging. We worked on writing poems and talked about different strategies we were noticing on the clips for performing them effectively. (Taylor Mali's "I Could be a Poet" is a hilarious way to highlight some of these techniques - watch out for one swearword.) We met for a few minutes each day in committees and I rotated from group to group to be sure everyone was making doable plans. In each class, I arrived Friday to poetry slam venues that varied wildly. One class held their slam on a beautiful school patio with flowers hanging from the trees overhead. One class sat on the bleachers by the baseball field. One welcomed us to our classroom, after remaking it to look like a coffee shop. The before-lunch slam featured burritos. In one memorable slam, the emcee rapped the introductions for each poet. It was an incredible day. 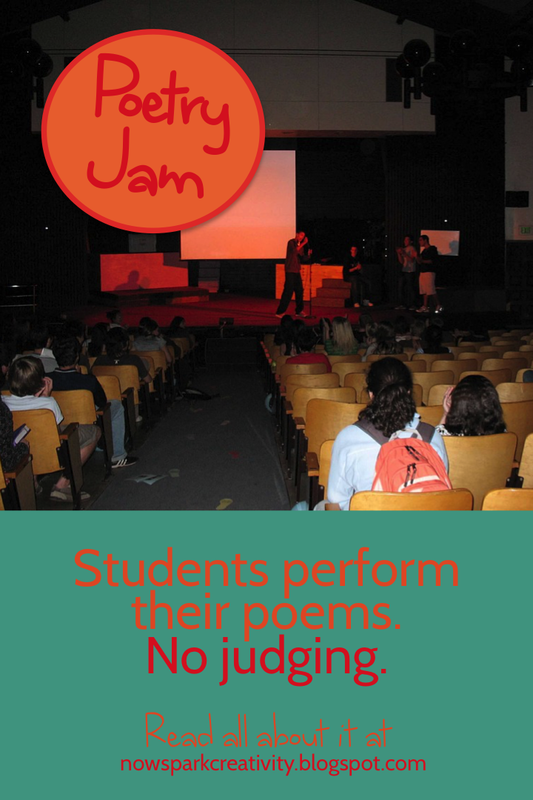 Watching my students perform their poems all over the school, cheer wildly for each other, coordinate their own judging, and truly enjoy the process was very moving for me. It began a career-long interest in poetry slam. At this point I've held over twenty poetry slams with my students, and every one has been amazing. One year I decided to culminate the poetry slam sequence with a poetry jam. The poems had been so good, I wanted them to have a wider audience. I asked the place winners from each class to perform their poems in the auditorium at lunch for all of my students and any others who were interested. No judging, just joy. I invited our academic dean and several others. Though many of the performers were nervous leading into it, they received a warm welcome on stage and they ended up feeling so proud. If for some reason you feel your students would not respond well to the slam concept, producing the unit as a jam gives you a non-competitive alternative with all the same features. Or you could use jam like I did, as a final showcase for the wonderful work put into the slams. I really can't recommend poetry slam (and jam) enough. It has been a high point of the year for me, every single year in the classroom. You can find some great resources for doing slam with your students in this roundup over on Digital Poet and this collection at Poetry Out Loud. Or if you are feeling busy and wish someone else would create this unit for you, I'm happy to say I have gathered all my resources together and made them available over at TPT. My poetry slam guide is one of my most popular pieces of curriculum, and it always makes me happy to imagine students around the world sharing the wonderful experiences my students and I have had with this unit. I invite you to share your own experiences with slam or ask questions about it in the comments below, or come on over to our Facebook group, Creative High School English, and join the conversation there. I always love to hear from you!